The Baby Trend Hybrid 3-in-1 Booster Car Seat provides safety and comfort for your growing child. It can be used as a forward facing five-point internal harness seat, a high-back booster and a backless booster. 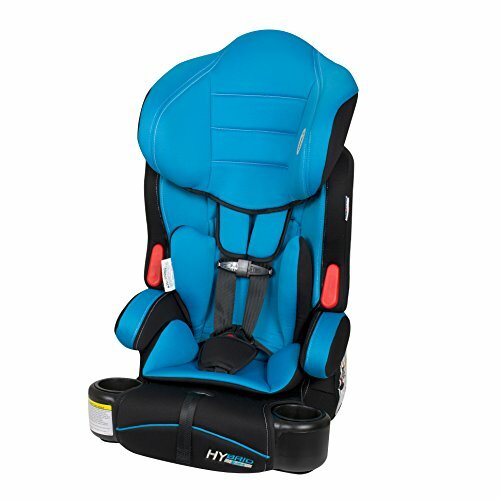 This car seat is very versatile and saves you money as you can buy one hybrid instead of a toddler seat, booster seat and backless booster. The six-position head support provides superior side impact protection while the five-point safety harness offers four height positions for a correct and comfortable fit. Comfort features include a removable insert the ensures small children are comfortable and fit correctly, padded strap covers, padded arms rests, one-hand front harness adjuster and removable, washable covers. The Blue Moon Baby Trend Hybrid 3-in-1 Booster Car Seat also comes with two built-in cup holders for drinks and snacks. The 100-pound weight capacity means the seat will provide years of safety and comfort for your growing child.